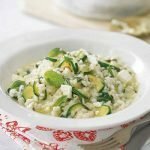 Our latest courgette recipe is a refreshing treat perfect for a lighter supper or lunch (perfect for picnics!). It’s a treat the whole family would love! Preheat the oven to 200ºC, gas mark 6. Mix together the Greek yoghurt, garlic, harissa, lime zest and lime juice. Season and add the chicken, stirring until coated. Marinate for 10 minutes. Place the chicken on a baking tray, spoon any excess marinade on top and bake for 25 minutes or until cooked through with no pink meat. 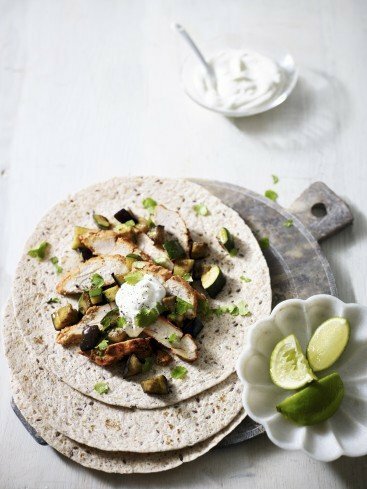 Meanwhile, heat the oil in a frying pan and cook the aubergine, courgette and ground coriander for 4–5 minutes until tender and golden brown. 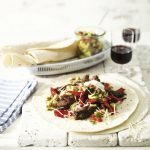 Warm the wraps, top with the vegetables, sliced chicken and extra yoghurt, then sprinkle with fresh coriander and serve with extra lime wedges. 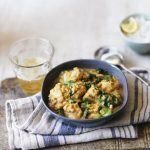 Cook’s tip: This can also be made with halloumi for a meat-free version. Simply use in place of the chicken and griddle for 2 minutes on each side.